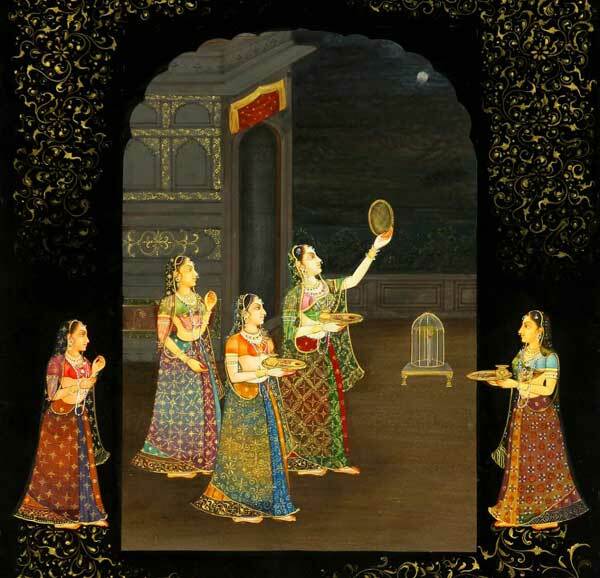 Karva Chauth is a one-day festival celebrated by Hindu women in North India in which married women fast from sunrise to moonrise for the safety and longevity of their husbands. The festival falls on the fourth day after the full moon, in the Hindu lunisolar calendar month of Kartik. Women begin preparing for Karva Chauth a few days in advance, by buying cosmetics (shringar), traditional adornments or jewelry, and puja items, such as the Karva lamps, matthi, henna and the decorated puja thali (plate). The fasting of Karwa Chauth and its rituals are observed by married women for the long life of their husband. Married women worship Lord Shiva and His family including Lord Ganesha and break the fast only after sighting and making the offerings to the moon. The fasting of Karwa Chauth is strict and observed without taking any food or even a drop of water after sunrise till the sighting of the moon in the night.